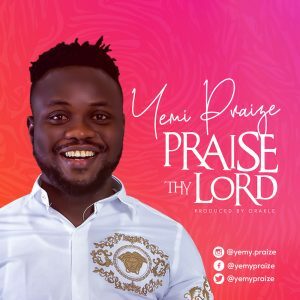 Yemy Praize, a Nigerian based gospel artiste, shares a brand new gospel song tagged, "Praise Thy Lord", produced by Orakle. "Praise Thy Lord" is a gospel worship song that appreciates the Love and Mercies of God in the life of someone close to the writer. Yemy Praize gets inspiration to write his songs from "spending quality time with the Holy Spirit, and in the gathering of saints, with John 4:23 coming to mind". In 2017, Yemy Praize launched his debut album, "Jesu Loba". 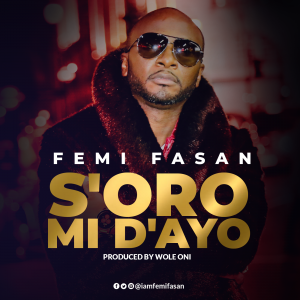 He followed it up with another massive hit, "Iyin Ye O", where he featured gospel music minister, Mike Abdul. 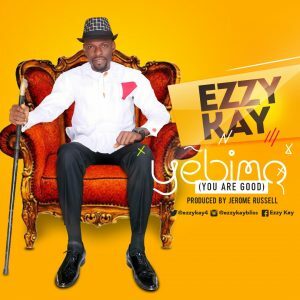 Ezzy Kay had this to say about the new release: "Yebimo" is a song of gratitude to God for being so good and gracious to me. When I look back at where God picked me up from, where I am now and where He's taking me to, I'm overwhelmed with joy and gratitude. "My music career has been a journey of grace. I thank God for bringing me into a ministry like Christ Embassy, where I've been inspired and motivated to live the victorious life of Christ, thereby maximising and utilising my potentials. I'm just so grateful to God." 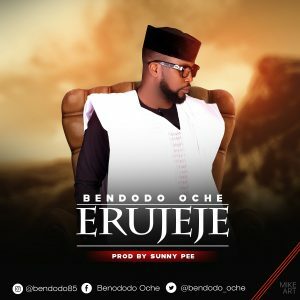 Singer, Songwriter and On-Air Personality, Bendodo Oche has released a powerful new single titled - "Erujeje" (The God that answers by fire). So to everyone going through something that has caused or is causing pain and endless tears. You feel rejected and dejected, shame seems to have covered your glory and it looks like God has forgotten you. I have got news for you, God can never fail. He can never change, He is Good personified and He wants to give you everything good. Keep your focus on Him, do not loose your praise and your faith. He will surely answer by fire. If He could close the mouth of lions for Daniel, part the red sea for Moses, open the prison for Peter, make the sun stand still for Joshua, put a baby in Sarah's arm, raise Lazarus from the dead, then permit me to say "your case is too infinitesimal". Your miracle is on the way. ERUJEJE has got you in His hands. I await your testimony. He will surely answer by fire. 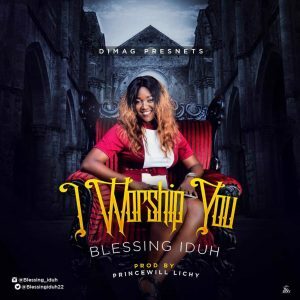 Nigerian renowned Gospel artist, singer, songwriter, praise and worship leader ‘Blessing Iduh’ dished out a brand news single, tilted: “I Worship You”. Blessing Iduh hails from Delta state but currently based in Awka. She is happily married with 4 kids and a computer science lecturer at “Nnamdi Azikiwe University, Awka. A Federal university in Nigeria. Her latest project ‘I Worship You’ was birth out of a heart filled with worship to God. Covenant Keeping God, Anietie Bature’s third single from her forth coming album ‘My Whole Life’, is an up-tempo, laid-back rider music laced with graceful lyrics and a symphony of harmonious sounds and melodies that create an enigmatic and charismatic world in which Anietie dazzles and shines. It is a boldly arranged song of gratitude, adoration and true praise that beats with modern rhythm. Listening to the song shows how profoundly skilled and lyrically inclined Anietie is. The single is yet another reason why Anietie Bature is among the next wave of gospel stars to look out for today. 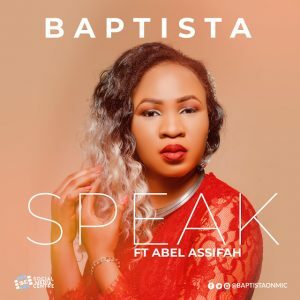 I think she should be the face of contemporary gospel music in Nigeria. 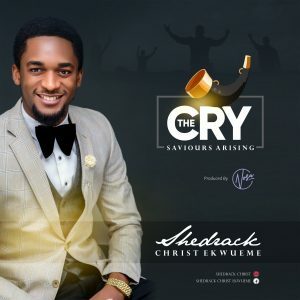 Stream, Download and share “Covenant Keeping God” with your friends and loved ones. It’s available on iTunes and The Minstrels. You can also click the link below to download it directly. 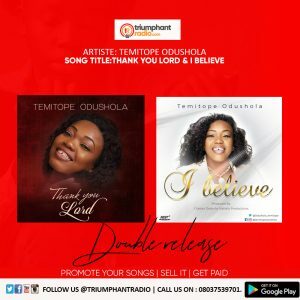 Temitope Odushola, Nigerian born international gospel music singer, ushers in March, 2019 with awesome double release titled “Thank You Lord” and “I Believe”.